2018 marks the 50th anniversary of the great uprising in France (1968). Now, massive strikes against the neoliberal attacks of Macron are under way there. Below, Birgitte N. reports that something similar may be in the works in Denmark. We should add this to the possible development of a new movement in the United States. A break down in the wage negotiations in 1985 in Denmark resulted in a near general strike. The strike gave some concessions to the workers among other 37 hours working week, but the employers achieved that the collective bargaining for private and public workers was split up so that the private sector workers negotiated one year and the public sector workers the following year. For both groups, the negotiations were for the future wages and working conditions for the next 3 years. After the crisis in 2008, the workers have been modest in their demands and the public sector workers are now behind the private sector workers in terms of wages. The present collective bargaining for the 750,000 public sector workers started in the autumn of 2017 with demands for a wage increases and influence on working hours. The public employers (the state, counties and municipalities) would not give as high wages as demanded by the public sector workers. Also the public workers demanded to keep the right to have a paid lunch break. The employers wanted to take this right away. From the outset, all the public sector unions joined forces and declared what they call a musketeer oath (one for all and all for one) to prevent the employers from being able to divide them. On Feb. 26 of this year the negotiations broke down and the public sector unions announced strike for between 60,000 to 70,000 public workers (10 % of the work force) from April 4, 2018. As an answer the public employers have announced lockout for 440,000 employees in education, public transport, health care, social services, childcare, elderly care, police, administration and other state, county and municipal functions. The public sector will be paralyzed from April 10, 2018 if this is carried through. The fierce attack from the employers reflects their attempts to break the unions and give the public workers a defeat and thereby also attack the public sector. This situation has resulted in 7,000 new public sector workers entering a trade union from January to March 2018. A poll has shown that around 66% of the population support the public workers demands. At the same time, there are more and more unions for private sector workers who support the demands of the public sector workers. The escalating conflict has created a split in the Social Democracy because the leadership will not support the public workers. 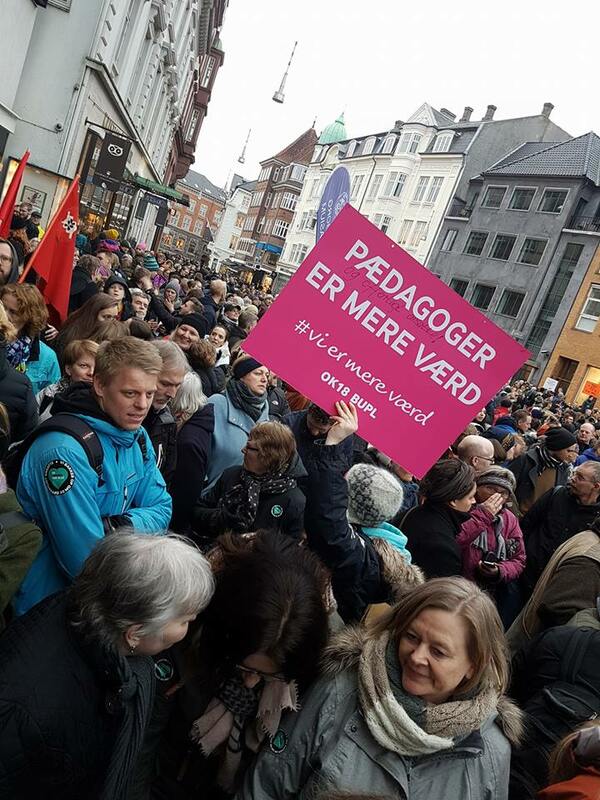 The local Social Democratic TUC in Aalborg (the third biggest city in Denmark) has made it clear that the chairman (a woman) of the Social Democracy will not be allowed to speak at their May 1stmeeting – which she was supposed to – because she does not support the strike. The consciousness of the public sector workers is increasing fast because of the violent attack, but also because of the anger about the constant cuts in the public sector since the crisis and the awareness that there is now recovery and thus money for improvements. The increased consciousness has been demonstrated at meetings where 800 shop stewards met in Copenhagen on March 20 and 10,000 shop stewards from all over the country met in Fredericia on March 22. The biggest shop steward meeting in the history of Denmark. At the meetings it was decided that everybody fight together and stick together under what they call the musketeer oath under the slogan “one solution for all”. This means in practice that from now on no one fight under the banner of each their own union but under the banner “one solution for all”. The mood at the meetings was high – everybody called for not to give in. We now see some politicians warn about the consequences of a conflict and appealing to the negotiators to reach an agreement. P.S. It is like an earthquake. It’s quiet and then suddenly….